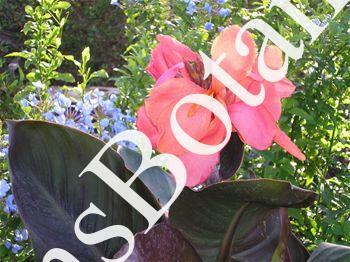 Canna Extravaganza is a beautiful dwarf canna 3 to 4 feet tall with dark bronze to purple foliage. The flowers are a pink to peach color and are 4 to 5 inches across. This Canna has shown to be a tough and great grower. A friend of mine who is a grower considers this one the best Cannas he has seen. After hearing his testimony I figured I would test it out and it is a great preformer and a must have in the garden.